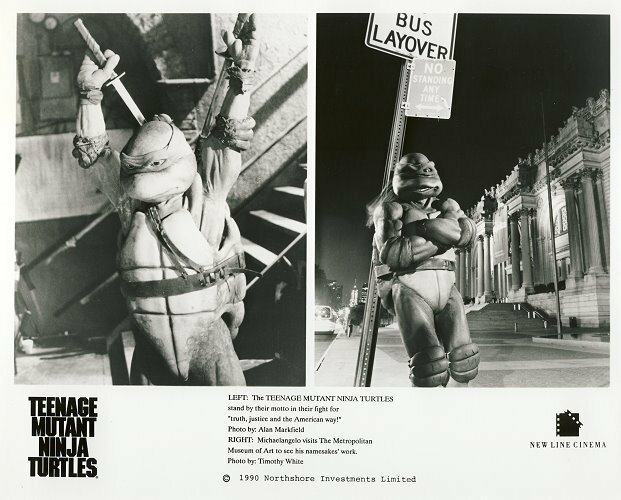 Without question, the real stars of TEENAGE MUTANT NINJA TURTLES are the animatronics developed by Jim Henson’s Creature Shop. Jim Henson himself referred to the creatures as the most advanced he’d ever worked with, and he sadly wasn’t to live much longer after the film was completed. The turtles are performed by martial artists with animatronic heads, and the technique works extremely well at conveying their sense of personality; it’s actually kind of difficult to think of them as “guys in suits.” Even more impressive and captivating is the character of Splinter. Voiced and operated by Kevin Clash (best known for SESAME STREET’s Elmo), he comes across as sort of an Asian mammal version of Yoda, and honestly has more depth than almost any human character in the movie. James Saito as The Shredder and Toshishiro Obata as the almost comically enraged Master Tatsu (both overdubbed with English voice actors for some reason, but you wouldn’t know it by watching) provide a good counterpoint to our offbeat heroes as ridiculously overblown Japanese stereotypes. I’ll be honest, I hadn’t watched this movie in about 15 years, and I went into it cringing a bit, braced for disappointment. The film came out in a strange in-between period in pop culture, where the excess of the ’80s was beginning to give way to the slightly grittier ’90s, and wow, the soundtrack featured a lot of gated toms and orchestra hits and lots of kids with hi-top fades. You already know all the surfer/skater slang hasn’t aged well. However, it didn’t take long for the charm of the film to take hold of me; these characters have depth and are engaging, and the silliness of the whole thing is quite addictive. The fight scenes are quite solid as well (the film was co-produced by Hong Kong-based Golden Harvest), and you have to remember that the movie comes from an era where modern Asian martial arts films were simply not being imported to the US, and the action box office was dominated by the likes of Steven Seagal slowly punching his way through a room full of bad guys, who were usually standing still. The pacing clicks, and the story arc is satisfyingly epic. As I was saying earlier, fantasy is expensive, and although this film didn’t have the kind of budget that is commonplace for mainstream films these days (it only cost $13.5 million! ), the pressure was certainly on for it to be kid-friendly and marketable. Thankfully it doesn’t take the amount of compromise that the 1987 animated TV series took; the foot soldiers are humans and not robots, sometimes people die, there is actual fighting, The Shredder is actually scary. The storyline mostly follows that of the early comics, and though a few elements of the cartoon are shoehorned in, it still feels like a huge step up. Parents may be the ones spending the money, and some of the most vocal ones may not like it, but kids want to see things that are actually good, and highly marketable and good don’t always overlap, especially throwing in the third variable of political correctness. 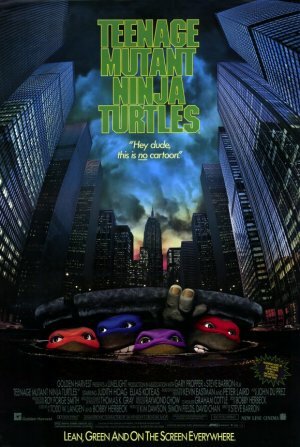 Of course, there was controversy at the time of the film’s release about the level of violence—and as a result the sequel released a year later had the turtles hardly using weapons at all. But for a brief moment, a good balance was struck between a kids’ movie and a movie about ninjas, and we’re lucky to at least have this. And as a genuine no-longer-a-kid, I can attest to it being entertaining for many adults too. The absurd concept was certainly ahead of its time, and it may not be fully realized theatrically until someone who grew up with the comics decides to produce the R-rated, SIN CITY of Ninja Turtles movies. I wouldn’t hold my breath if I were you. Nickelodeon just bought up all of the rights. This is a great review/recap of the film. Glad to see you still enjoyed it as much as I do. Hope to see you there tomorrow night! Oh, p.s. the wednesday show actually starts at 9:30. If you get there too early you can always go get a milkshake at the Majestic though!